I have always loved herbs and herb gardens. An herb garden is beautiful but when combined with plant lore and the history of gardening it becomes multidimensional and truly fascinating. Herbs, defined by Webster's as a plant or plant part valued for its medicinal, savory, or aromatic qualities, had many daily uses that we have forgotten today. Only a hundred years ago, most households with a bit of earth, grew things to ease pain, make your house smell better (those were smelly times) and make food taste more interesting (when you ate many of the same foods every day.) People made their own tinctures (medicines made from extracting the chemical compound of plants by soaking them in alcohol), laid plants in the house to keep bugs away, and sought out local and exotic plants to enhance their food. Today, the added advantage of growing herbs is that that most of these plants are not appealing to deer and other garden ravishers because of their strong smell and taste. Here is a list of a few plants that are beautiful, easy to grow, and have been very useful in human history. This plant gets 5 stars for good looks. 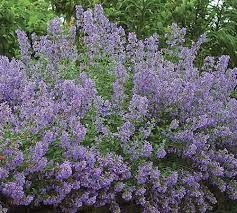 In the mint family (like all other monardas or bee-balms) this annual is easy to grow from seed and gets lots of comments in a northern garden, since most people don't bother doing it from seed. Flowers can be eaten in salads and leaves can be used to make a lemon mint tea. If you never have tried growing this I suggest giving it a try. Seeds can be found at Native American Seed. In Asia this plant is used often in cooking. Known for its garlic flavor, the stalks and immature flower buds are great additions on soups or salads. A very vigorous grower, the flowers last a very long time both on the plant and cut in water. 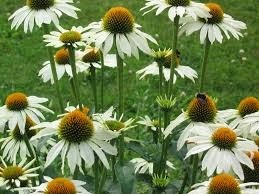 It adds late summer white to the garden when many flowers are orange and yellow. It creates a nice border of structure and seed heads are attractive late into fall. I know many of us already grow this reliable plant in our gardens. It blooms late May almost through to the end of the season (if cut back once) and is part of the structure that gives a garden form. That's why you may want to grow a few of the new great hybrids they have made in recent years to keep up with demand for this garden classic. Try Walker's Low or Dropmore Hybrid from Canada. Honeybees and butterflies love this member of the mint family. Try alternating catmnit, lambs ears, and lady's mantle in repetition down your border edge. Silver, blue and lime...a great color combination. 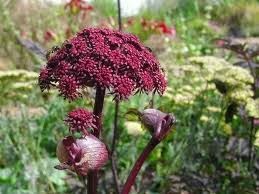 Another unusual plant for the northern garden, Angelica is a biennial that will be leafy the first season, but will reward you with impressive purple stalks the next. Flowers last much of the season, and seed heads are gorgeous. Plants don't mind a moist spot. It has culinary value as candied stalks or flavoring gin, and people from Lapland and the Aleutians used it for wounds and other ailments. 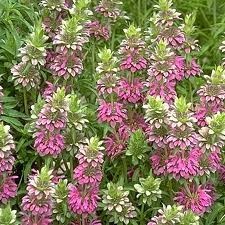 I suggest it for late summer drama in your border. You don't have make beer to enjoy the beauty of a hop vine. Many grow to 15 feet or over and can climb up any wire or stake. Try finding a long good looking stick (birch maybe) and have the vine grow up the pole. I have even made a ball out of copper wire for the top so the pole looks like a large topiary. The luxuriant strobiles give an abundant look to any garden trellis or rock wall. Grown since ancient times for its flavoring qualities, this plant is under used in today's gardens. 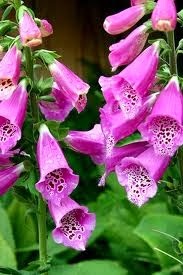 Foxglove is a plant I never can be without, even if it doesn't necessarily like where I put it. A biennial that blooms and reseeds in the same season makes it seem like a perennial. If it likes it where it is, it can bloom and reseed year after year. Deer know to stay away from this plant which has strong compounds used in cardiac medicine. Digitalis comes in many forms, including the sweet pale yellow Digitalis lutea and the Digitalis ferruginea that has won the Royal Horticultural Society's Award of Merit. 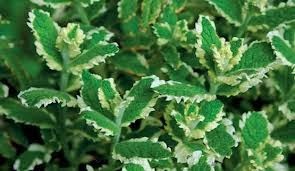 Though this variegated form of apple mint blooms, it is the foliage that makes this plant a staple. 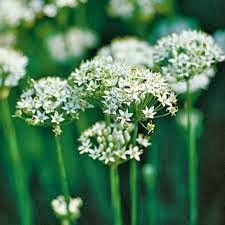 The white edges can be seem at great distance at dusk and can add drama to a patch of flowers that have only green leaves. Smells great in bouquets and doesn't have the same invasive qualities as much as other mints. Just take off the runners if they start to walk out of the spot you want it. This is an under used plant that I love for many reasons. A controlled self-seeder, it grows tall and bronze and the yellow umbels in late summer are covered with every kind of bee and wasp in your area. Since I often study wasps and bees for painting, I am amazed at how many varieties there are on one plant. I have it staked under a large picture window so that I can enjoy looking at the busy wasps from the behind glass! Flowers and foliage are great in bouquets, smell like anise and can be used in salads and pickling. Plants grow tall and may need to be staked. This common annual used to be grown by most households 100 years ago as a pain reliever, but is no longer legal to grow as such in the US. Thomas Jefferson's garden at Monticello had many varieties as did all the large estates. 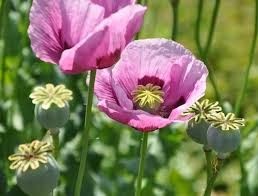 The laws are vague, but it seems if you grow them as flowers, and not medicine, it is OK. The problem is that it is hard to find seed. Seed can still be bought through European seedsmen such as Thompson & Morgan. My favorite garden blog by Margaret Roach, A Way to Garden, has great information about it all here. 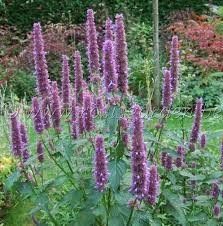 The last must-have garden staple is Agastache. Another plant that is loved by all pollinators, this sturdy and fragrant beauty is great in arrangements and can make a great tea. It blooms for many months and reseeds well. I used to edge the whole vegetable garden with it as the deer do not like things in the mint family. Try varieties like 'Blue Fortune' or a red like 'Desert Sunrise'. 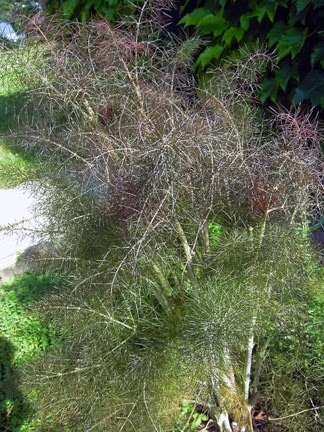 Read about many varieties in this Fine Gardening article.